I love sugar cookies but I absolutely detest any cookie recipe that requires a rolling pin. I don’t know why I have this utter hatred of such a simple kitchen tool but any sugar cookie recipe I have found up until now has required rolling it out and using cookie cutters. But, one day I was scrolling through the almighty Pinterest and I came across an amazing thing. A sugar cookie recipe that is cooked as a bar cookie and requires no rolling out whatsoever. Amazing! How did I not know that such a thing existed? 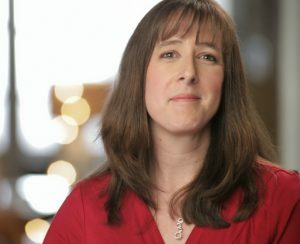 So, I started Googling sugar cookie bars and apparently there are a whole lot of people that have already figured this out! 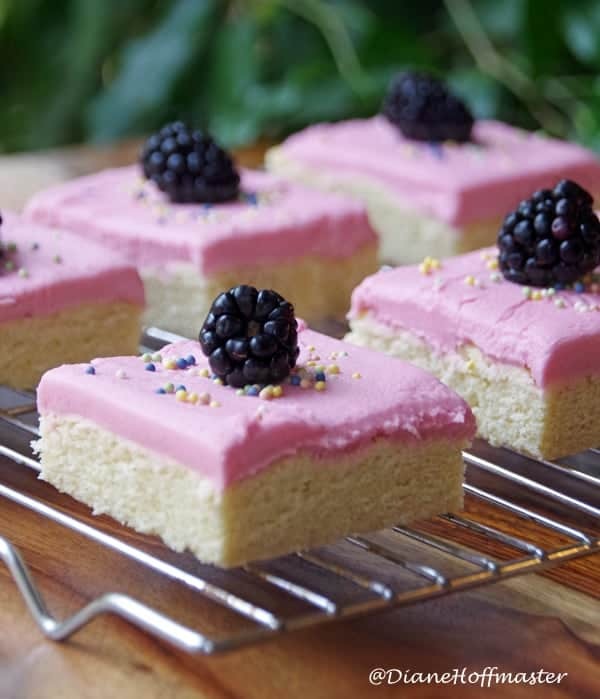 I decided to whip up some sugar cookie bars and try making a pretty colored frosting for them with the blackberries I found on sale at Sprouts this weekend. I hate adding artificial food colors to things I cook so I cooked down a few blackberries and put them through a sieve to give me a dark purple juice to work with. I achieved a pretty, light purple frosting and then topped each sugar cookie with a blackberry and some (–>> affiliate link!) all natural sprinkles. I think they came out very pretty and they taste just like a sugar cookie that was rolled out and cut with cookie cutters. Only it was a WHOLE lot less work! 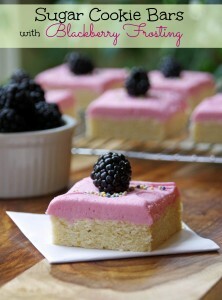 Delicious sugar cookie bars that take only minutes to make. Add in sour cream and vanilla. Beat another minute. Mixture may look slightly lumpy. Slowly add the dry mixture to the wet mixture, mixing gently half way through. When flour is completely mixed in, spread mixture into pan. Use hands to press dough all the way to the edges. Bake at 375 degrees for 15 to 18 minutes or until edges are just turning golden brown and center feels almost firm. Add 10 to 12 blackberries to a small sauce pan with 2 to 3 TBSP heavy cream and put over low heat. As they warm, use a spoon to gently crush the berries. After heating for 5, remove from heat and put mixture through a fine sieve into a large mixing bowl. Into the mixing bowl, add the softened butter and half the powdered sugar. Beat gently. Mix until smooth. Add remaining powdered sugar until you reach desired consistency. Spread frosting over cooled bars and cut. Add a blackberry to each bar and sprinkle with sprinkles if desired. These sugar cookie bars were inspired by The Baker Chick.